Can You Get a Refund from Your Blogger? You hired a blogger and they delivered the work. You’re not happy, though, and now you want to know if you can get a refund from your blogger. After all, if you weren’t happy with a product, you’d take it back for a refund, right? Well, getting a refund from your blogger isn’t that easy. It will depend on the circumstances, the terms of the agreement, and the method you paid. 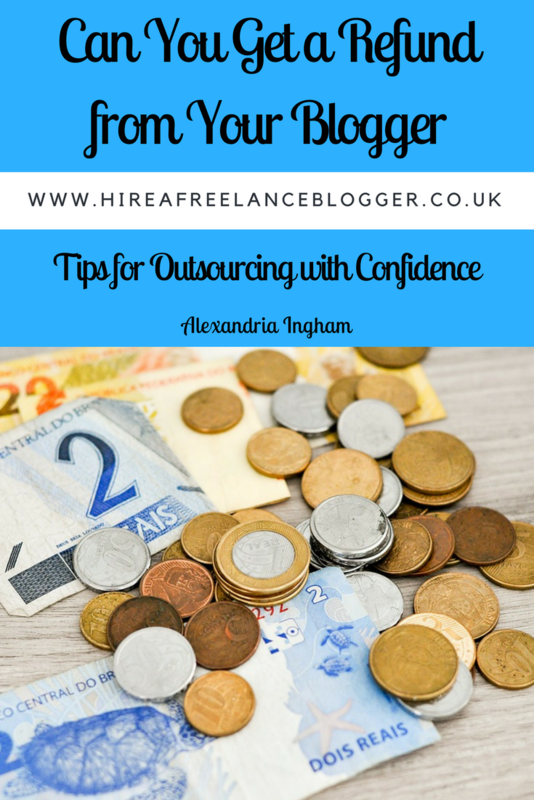 Before you just straight to the refund, make sure you talk to the blogger and try to work out the problem. Has the blogger failed to deliver anything and a deadline passed? Get in touch and find out where the work is. You may find that an emergency genuinely came up. I always deliver projects early to my clients. At least, I aim to. My own deadlines are always days ahead of the client deadlines to make sure that emergencies don’t come up and cause a problem. But not every blogger will do that. Some bloggers don’t anticipate problems or will have an emergency go on longer. Of course, there are also scammers and time wasters out there. If you don’t get a response within 24-48 hours, there are chances that your blogger has no intention of delivering your content. Likewise, if you’re not happy with the quality or some of the information, talk to the blogger first. An editor would send a piece back for review rather than outright deny it in the majority of cases. It is possible that project guidelines weren’t as clear as initially believed or the blogger didn’t quite capture your blogging voice perfectly. These things can be worked on, especially if you have a willing blogger. Most will do revisions for free to help with this problem. But when it all goes wrong, you may want to ask for a refund, right? 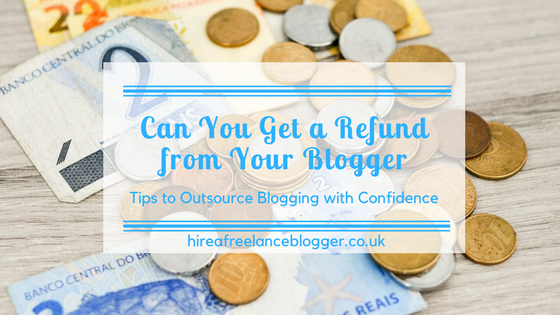 Here are a few instances that refunds from your blogger are perfectly acceptable and how you should go about them. Let’s start with the biggest no-no in blogging every: plagiarized content. If you find out your blogger has copied information or content from anywhere (whether in full or partially) then you have every right to request a refund. However, do tread carefully. If it’s a quote or the keyword phrase that you chose coming up, then they’re not necessarily plagiarized. The quote should be properly attributed and shouldn’t be longer than around 50 words (this is fair use). If the whole piece has been copied and pasted, then there’s no need to give the blogger the benefit of the doubt. This is stealing and you want to pull the blogger up for it immediately. If the blogger attempts excuses or refuses to refund, you’ll need to take other steps and this will depend on the method of payment. We’ll get onto that at the end. Quality is the most important aspect to me when writing a blog post. It doesn’t matter what type of blog post I’m writing (or even the type of content I’m writing). Poor quality content will turn people away. The odd typo is going to be fine but if your content is littered with incorrect spellings and bad grammar, people are going to view you as a scammer. It’s important to get samples from any blogger you consider hiring. This will tell you the writing quality, as well as the ability within a niche. If these look good, then you shouldn’t have anything to worry about. The problem arises when you go through an agency. The samples can look good, but you’re not necessarily going to get the writer who wrote that sample. In fact, that writer or blogger may no longer be there. You end up with poorer quality content than you expected. And it’s not just about the writing skills. You need to make sure your blogger understand your topic/niche. When the quality isn’t as expected, it’s worth working with the blogger first. Explain the problem clearly and politely and let the blogger make some changes (in this case, the revisions should ALWAYS be free). If the blogger still hasn’t been able to make changes, then you should ask for a refund. If the blogger isn’t willing to make the changes for free, it’s time to ask for a refund from your blogger. There is only one instance when I would question the refund. If you just don’t like the style personally but it would work for your audience, that’s not a problem with quality. It means you two aren’t suited for each other and you’re best finding another blogger for a future relationship. It’s not right to ask for a refund in this case. You thought you wanted a blog post about one topic but later changed your mind. However, the blogger has already written and delivered that work. Whether it was weeks early or right on the hour, that blogger has put in the work. You changing your mind doesn’t give you a reason for a refund. It would mean more work on the blogger’s part, which isn’t something that they could have factored in at the initial time of writing. The only time that a refund would be due is if you sent the message and the blogger acknowledged that they hadn’t started working on the current work. I encourage my clients not to pay for something until they are completely settled in what they want and we’ve agreed on a deadline. I won’t start working until at least 50% of the work is paid for, so until that point minds can be changed freely. Unfortunately, I’ve had experiences of clients changing the scope of the work after I’ve delivered it. Or they’ve added further information that would mean a complete rewrite. Now you’ve decided that you want (and should get) your refund, it’s time to find out how to do it. This really will depend on the way that the money was paid. In an ideal world, the blogger will just pay the refund without any complaint. This is of course if the blogger agrees that a refund is due—remember there are times that a refund wouldn’t be valid. If the blogger doesn’t cooperate, you will need to go through the channels you used to pay. If that was PayPal, you’d need to open a dispute and share why you believe you should get your money back. The blogger will need to prove that the contract was adhered to. If you paid by credit card, you will need to go through your institution. If you paid by bank transfer, that once can get a little trickier. Your bank doesn’t have the legal ability to just take the money back like PayPal or your credit card company. It’s one of the reasons I never use bank transfer or debit card for any types of purchases. Make sure you have a contract in place. 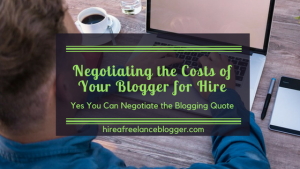 This will help you prove that the blogger didn’t meet the requirements agreed to in the contract to help you get your refund. Do you still want a refund from your blogger? Make sure it’s a valid reason. I do recommend trying to work it out, though. The majority of bloggers will run a small business and it may have been a genuine mistake or emergency. When Should You Write Your Own Content? Is There a Best Time to Update Your Blog? 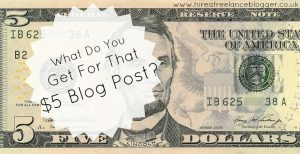 Just What Will You Get for That $5 Blog Post?